Granny Scholz, the mid-wife who delivered “The greatest batsman the world has ever known” Sir Donald Bradman on 27th August 1908, operated a small private hospital in the front room of the building at 89 Adams Street. The building was refurbished in 1991, and now his birthplace has been lovingly restored with the official opening on 23rd October 1992. The birthplace cottage contains memorabilia of Sir Don, of cricket and of the Cootamundra district. 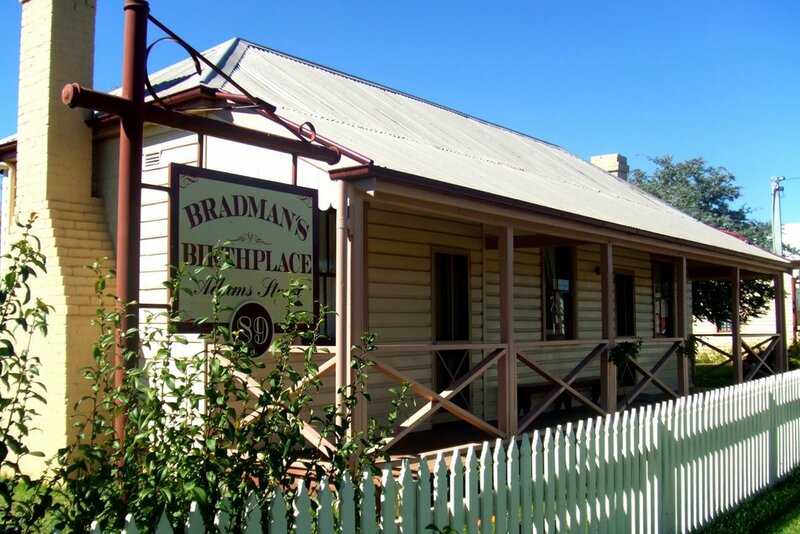 The Bradmans Birthplace is situated at 89 Adams Street, Cootamundra and is complimented by the Memorabilia Cottage at 87 Adams Street. It was the initiative of Cootamundra Shire Council to purchase and develop these sites for future generations. The property next door to Bradman’s Birthplace, called Memorabilia Cottage, contains a nostalgic display of curios, bric-a-brac and Australian memorabilia, much of which dates back to the era when Sir Donald Bradman was born. except New Years Day, Good Friday and Christmas Day.